Concordia mourns the loss of Monsignor Russell Breen, former Dean of Arts and Science at Loyola College and a key creator of Concordia University, who passed away on June 26. In an obituary published in The Gazette on June 28, Mnsr. Breen was described as a visionary. His father was a stevedore at the Port of Montreal. Breen, the fifth of four boys and three girls, was raised in a small English-speaking parish, St. Aloysius, in east-end Montreal. He studied arts at Loyola College, and theology at the Université de Montréal and the Grand Seminary, and was ordained by Cardinal Paul-Émile Léger in 1950. At 26, he was named Roman Catholic chaplain at McGill University, a position he held on and off for 14 years. He also served as national chaplain of the Canadian Federation of Newman Clubs, an association of Roman Catholic students. Breen received his master’s degree in philosophy from Fordham University in New York and in the early 1960s went to France for his doctorate in religious studies at the Université de Strasbourg. There he wrote a thesis on Anglican theologian Charles Gore. He returned to Montreal in 1968 to teach ecumenical theology at the Université de Montréal for a year before joining the faculty of Loyola. 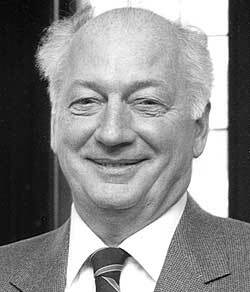 After helping engineer the 1974 merger of Loyola and Sir George Williams University, he served for 12 years as one of Concordia’s two academic vice-rectors. Professor Donat Taddeo, who is currently director of the McGill University Hospital Centre Foundation, called him persuasive and tenacious. Breen had views on the role played by the church. “More young people will be committed to the church to the extent that the church concerns itself with renewal,” he used to say. The pope appointed Breen monsignor in 1981. Five years later, he was named the ninth rector of St. Patrick’s Basilica. He was responsible for the five-year, $4.5-million restoration of the historic building, which was completed in the spring of 1993. He was an avid skier, enjoyed boxing matches and was a devoted Montreal Canadiens fan. He suffered a stroke in 1994 that left him unable to speak and in a wheelchair. He is survived by his sister, Laurine McIntyre, to whom we extend our sympathies. The funeral mass took place June 28 in St. Patrick’s Basilica.